THE PECULIAR STYLISTIC INNOVATIONS OF AN EDWARDIAN SYMBOLIST! Hardback, square format (8.5 x 8.5), 220 pp. Produced using archival quality print upon a superb soft white, 110gsm acid-free archival art paper  profusely illustrated throughout together with an index of bookplates by artist. Bound in a black subtle weave linen finished paper and elegantly blocked in matt black and gold on the upper board. £50.00 plus P&P. 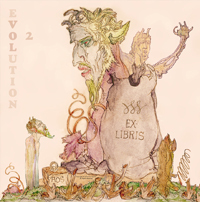 The aim of the Evolution series is to demonstrate that Spares art (and also his occultism) did not exist in a vacuum and in A Fearful Asymmetry, the second volume in the series, Austin Spares bookplates are closely scrutinised to provide a deep contextual insight into many of the artists most intimate preoccupations. Amongst the most constrained works of an any artists output is usually the bookplate being predominantly tailored, controlled and mediated by the desires of the commissioner. The artist is therefore required to interpret and encapsulate, the rank, interests or self-perceptions of his client whilst remembering that he must create a visual ambassador to proclaim the book owners interests. Spare produced countless artworks comprising of drawings, paintings, pastels and dozens of sketchbooks but it is his bookplates which reveal a dependence upon patronage to survive as an artist in London, through two world wars. His five published books represent the development of his ethos and magical praxis but it is his devotion to graphic reproduction, used to convey his personal vision, which is reflected in the bookplates. The degree of latitude given to Spare in producing bookplates was clearly very varied  whilst the bookplate for the connoisseur John Oswald is remarkably restrained those produced for Pickford Waller suggest that despite being given carte blanche he still struggled to temper his natural exuberance with the needs of his patron! However, in the design for André Raffalovich Spare is completely unfettered and his interest fully engaged. Furthermore, it must be remembered that during Spares lifetime bookplates were usually produced for a particular type of person and accordingly certain contextual preconditions apply  in Spares case the majority of bookplates were for friends and other individuals whom he held in high regard  amongst these were collectors, bibliophiles and above all, members of the Edwardian cultured class. As a working-class prodigy Spare had found himself thrust into the cultured circles of those who would become his most fervent admirers. He observed them in their homes and salons with an informed and honest curiosity from his own background whilst seeing both their merits and their less avowable aspects. His bookplate designs therefore emphasize the subjects individuality with the very motifs which suggest mechanisms by which human potential can be extended or enhanced and yet they remain paradoxes, articulating the interests of a typical, educated Edwardian individual whilst containing covert nuances, gestures and symbols of a far greater frame of reference. A Fearful Asymmetry presents a panorama of the graphic stylistic of the Edwardian and inter-war eras and places Spares bookplate production within an outline of the social and commercial conditions that influenced the production of these fascinating items. In order to convey the full cultural context, artistic scope and immense facility of Spares achievement the book is replete with examples of those artist print-makers who preceded him, those he had contact with, and those who influenced his work. Particular emphasis is also placed throughout to illustrate the existence of a deep continuity between the devices associated with the tradition of armorial ex-libris, Spares graphical bestiary in particular and his art production in general festooned with the transmuted insignia and decorative material of this traditional form of encrypted display. This book weighs approx. 1kg when packed. For International orders we use Royal Mail Airsure which is a tracked service requiring a signature on delivery. Cost for P & P for this item will be Europe £12.95 and Rest of World £17.95 but please note our shop software will only add £2.95 for P&P for the UK only. Credit Card — check out normally — when we process your order we will charge your card with either £10.00 for Europe or £15.00 for Rest of World postage supplement. A limited edition of 525 numbered copies. Hardback, large square format (12ins x 12ins), 222pp. Bound in a black subtle weave linen finished paper and elegantly blocked in matt black on upper board and matt gold on the spine. Produced using archival quality print upon a superb 110gsm acid-free, soft white, archival art paper. The work is profusely illustrated throughout and has a comprehensive Index. 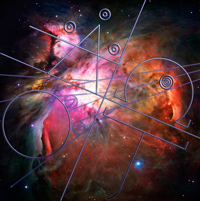 An invaluable manual and research tool for serious students of Magick and Western Esotericism  a nexus spanning Enochian Magick, Ley Lines and Geomagnetism, Chthonic Magick, Shamanism, and much more. Sacred Alignments is the next step in sigil magick  the development and use of multidimensional sigils that can be simultaneously projected inwards and externally beyond the immediate confines of the individuals mundane sphere. The Sacred Alignments & Dark Side of Sigils is innovative amongst modern grimoires and occult studies and introduces the reader to The Grid Sigil  an highly developed magical tool that acts as a sigil, not just in the sense of Austin Osman Spares notion of a sigil (as an internalized implement) but as an active device for external applications such as dowsing, working with the four elements, etc. The Grid Sigil is a multidimensional tool that potentially acts as a catalyst to assist the practitioner (through careful meditation and application) with work in harnessing various spatial power zones and as an aid in comprehending the relationship between microcosm and macrocosm. Sacred Alignments is not simply a manual of practical modern magick but a scholarly, critical study of modern Sigil Magick and its underpinnings. It is rooted in the thoughts of Robert Grosetteste, the medieval concepts of the Divine Signature, and Eastern antecedents such as Tantric Philosophies on Yantra and Mandala. This book is large and weighs over 2kg when packed. For International orders we use Royal Mail Airsure which is a tracked service requiring a signature on delivery. Cost for P & P for this item will be Europe £14.95 and Rest of World £24.95. Our shop software will only add £2.95 for P&P for the UK only. Credit Card — check out normally — when we process your order we will charge your card with either £12.00 for Europe or £22.00 for Rest of World postage supplement.